The village of Maria Rickenbach in the Swiss Alps has been a place of pilgrimage since the 1500s when a wooden statue of the Virgin and Child was miraculously preserved from fire. In 1853 two women wanting to start a convent of Perpetual Adoration chose this location to begin their work of prayer. Not far from Engelberg, Maria Rickenbach is situated on a green plateau with the towering Musenalp behind it, overlooking the valley of Engelberg, the Nidwalden Alps, the Stanzerhorn and Mt. Pilatus. It is one of the loveliest sites in all of Switzerland. A life of unceasing prayer is the aim of the sisters of Maria Rickenbach. They pray the Divine Office, celebrate Eucharist, have continual adoration of the Blessed Sacrament, and take time for other personal prayer and reading. In keeping with Benedictine tradition, this work of prayer is balanced by the work of their hands. Their primary self-supporting work is cultivating herbs and preparing various teas, tinctures, ointments, and schnapps. Many years of experience have made them proficient regarding the different properties and use of herbs. From generation to generation of sisters, the art of drying and preparing herbs has been passed down in the community. In addition to growing many of the herbs they use, they have permission to collect wild herbs growing in the mountain meadows. Often, harvesting these is a full day's work, so the sisters pack a picnic lunch and pray and eat outside, enjoying the majesty of God's creation. Their love for the earth and reliance on its bounty renders them dedicated stewards of the environment. 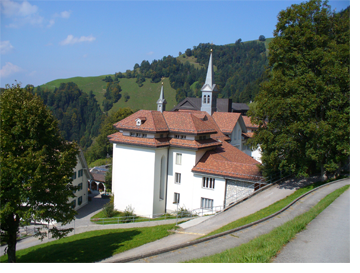 Although the convent is accessible only by cable car, the sisters welcome many visitors each year, usually pilgrims going to the shrine of Maria Rickenbach or travelers on holiday. All are invited to browse the convent gift shop which carries the sisters' herbal remedies and handicrafts of fine embroidery and weaving, liturgical vestments, altar cloths, and miscellaneous items. The Benedictine Sisters of Perpetual Adoration in the United States are spiritually and affectionately connected with the sisters of Maria Rickenbach, but we are not financially or legally bound to them. We owe them gratitude for sacrificing members of their fledgling community to engender life on this continent in 1874; and we continue to draw mutual inspiration and strength from each other as we witness to Christ's presence in the world.